A duo that you have never seen before: High-end luxury brand Karmaloog is collaborating with Hublot to launch a unique jacket and watch set that will beat every superlative and redefine luxury fashion. 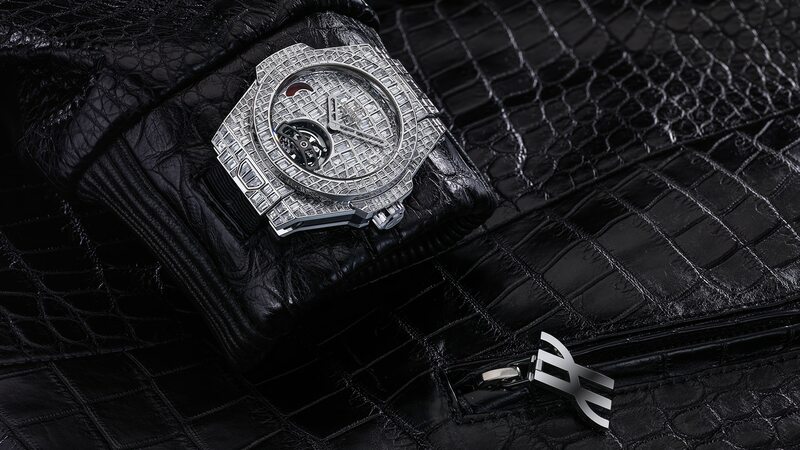 Karmaloog designs a bullet resistant jacket made of the finest crocodile leather and combines it with a Hublot watch established with 16.41 carats of diamonds. A million-dollar set that will amaze the fashion industry, custom-made for you! Two powerhouses have initiated an extraordinary partnership that combines fashion, haute horlogerie and cutting-edge technology. Hublot is internationally recognised for its innovation and fusion of material, therefore being an excellent and fitting partner for Karmaloog. The design of the jacket reflects Hublot’s values as Karmaloog added leather, gold, diamonds, bulletproof material and innovation. Founders Racho Bajadjan and Nezir Yozgat have created their brand specialising in ultra luxurious clothing and accessories, using only the skills of the finest craftsmen and are renowned for only working with the most exclusive and refined material. Selecting a suitable leather skin is a delicate process, and it can take up to several months to find the perfect material for an item. 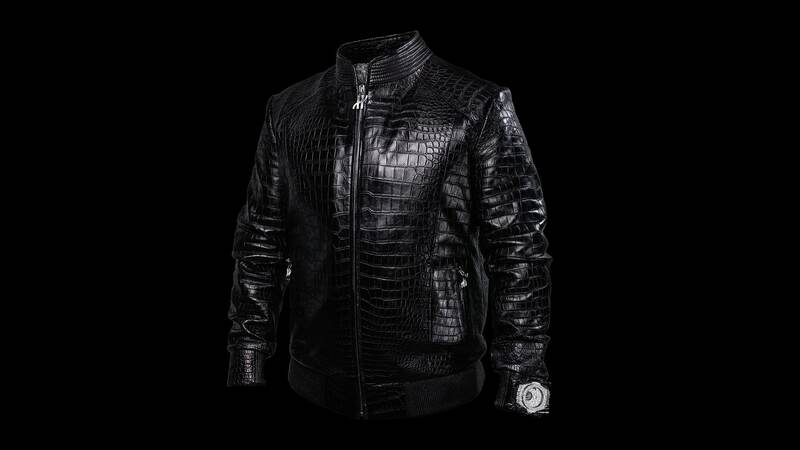 For this spectacular partnership Karmaloog’s artistic director Racho Bajadjan has designed an astonishingly stylish bomber jacket, made from black crocodile leather. Karmaloog carefully hand picks their leathers only from suppliers that guarantee the international animal laws are respected. The extremely fashionable and exclusive statement jacket has been created with a unique lining, a material developed using the latest technology to add protection without bulk it is called Carbon aramid fabric and made possible by multiple layers of finely woven carbon nanotube fabrics. This enables the jacket to withstand and absorb the impact of powerful projectiles*. The lining has then been covered in elegant screen-printed silk using Hublot colours. Karmaloog is known for exceeding limitations and thoroughly understands what their audience wants. The brand targets customers who seek exclusivity and unique statement garment that will make them stand out even more. Karmaloog’s gear can be fully customised by the wearer, which is also the case for this special collaboration with Hublot. The client is able to customise the various zip closures on the jacket. A set of three jewellery sliders is provided for each zip closure: The main slider at the front is 18 carats white gold and paved with diamonds (39 diamonds totalling 0,88 carats) combined with a slider crafted in white gold and two side pocket sliders all in the shape of an H ( for Hublot), these sliders are interchangeable with the recognizable Karmaloog sliders hand crafted in 18 carat white gold. 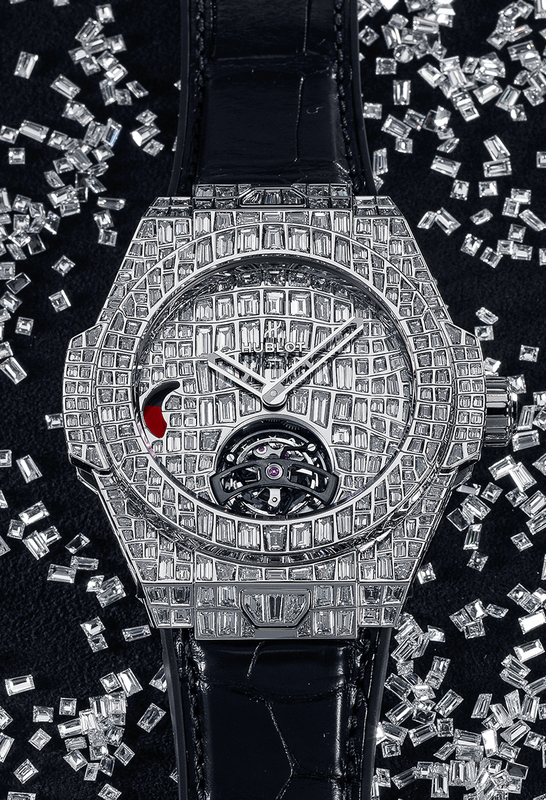 Two powerhouses have initiated an extraordinary partnership that combines fashion, haute horlogerie and cutting-edge technology. Hublot is internationally recognised for its innovation and fusion of material, therefore being an excellent and fitting partner for Karmaloog. 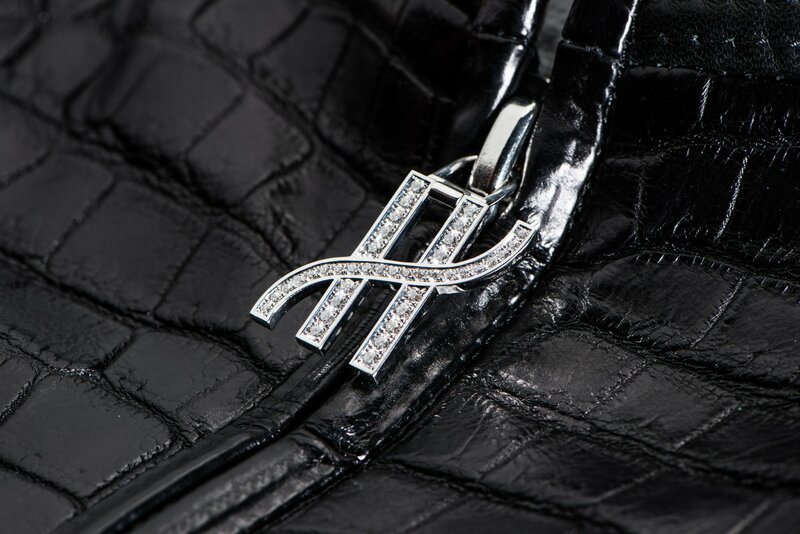 The design of the jacket reflects Hublota’s values as Karmaloog added leather, gold, diamonds, bulletproof material and innovation. Founders Racho Bajadjan and Nezir Yozgat have created their brand specialising in ultra luxurious clothing and accessories, using only the skills of the finest craftsmen and are renowned for only working with the most exclusive and refined material. Selecting a suitable leather skin is a delicate process, and it can take up to several months to find the perfect material for an item. For this spectacular partnership Karmaloog’s artistic director Racho Bajadjan has designed an astonishingly stylish bomber jacket, made from black crocodile leather. Karmaloog carefully hand picks their leathers only from suppliers that guarantee the international animal laws are respected. The extremely fashionable and exclusive statement jacket has been created with a unique lining, a material developed using the latest technology to add protection without bulk it is called Carbon aramid fabric and made possible by multiple layers of finely woven carbon nanotube fabrics. This enables the jacket to withstand and absorb the impact of powerful projectiles*. The lining has then been covered in elegant screen-printed silk using Hublot colours.